After craving indian food at the weekend, I thought I would have a go at making a dish that would satisfy my tastebuds. These Vegan Indian Pancakes are egg, gluten and dairy free and when combined with the fresh flavours of cumin, coriander, tomatoes and lime they make for a very balanced and filling dish. If you like indian flavours, this is a nice, quick & easy twist to traditional indian dishes. Begin by chopping the onion, tomatoes, pepper, chilli and coriander and grating the carrot so they are ready to use and set aside. In a frying pan, heat a tbsp of olive oil on full heat, add the mild curry powder, cumin seeds and onion and fry until the onion softens. Next turn the heat to half heat, add the beans and cook through for 2 – 3 minutes (if the mixture begins to stick, add a splash of water). After the 2 -3 minutes, add the grated carrot, chopped tomato, chopped pepper and tomato puree and season with salt. Cover and leave to cook, stirring occasionally, whilst you make the pancakes. Add the flour, chopped onion, chilli, cumin seeds, cayenne pepper and salt into a mixing bowl. Gradually pour in the sparkling water, using a whisk to combine the mixture. Add enough sparkling water until your mixture resembles a batter. Add the olive oil to a small frying pan and place over a high heat on the hob. When the oil is hot, carefully pour the excess into a separate container and set aside for later use. Pour 1 ladel of pancake mixture into the frying pan and circle the mixture round to coat the whole pan. Put the pan on the heat to cook, look out for the mixture bubbling upwards (this will take approx. 1 – 2 minutes). Once the mixture begins to bubble, use a fork to carefully edge the pancake away from the surface of the pan and flip the pancake over. Cook for 2 minutes. When the pancake is cooked to your liking, place on a plate and repeat the process above until you have enough pancakes / all the mixture is used. Remember to add oil to the pan and drain any excess before cooking a new pancake. Place 1 pancake on a plate, cover half the pancake with the bean filling. Sprinkle with chopped fresh coriander and squeeze over some fresh lime juice. Fold the pancake over and serve. Vegan Indian Pancakes would be delicious served with a fresh No Salad Dressing salad, some Lime Pickle, poppadums and a yogurt & cucumber dip. 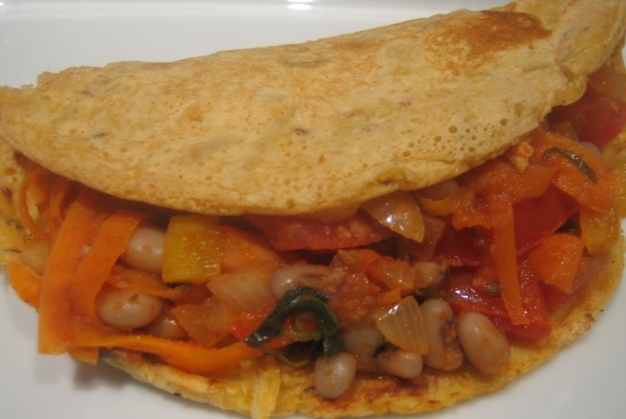 These Vegan Indian Pancakes are a quick to make and satisfyingly tasty dish.